While riding jet skis with his wife in 2000, Chris Handy was inspired to create his first game design, a horse racing game. 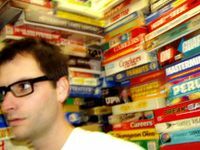 In 2004, "Linkity", Chris' first published game, was released by SimplyFun triggering the first of three "Major Fun Party" awards for his first 3 published games. His "Plext", was listed in the GAMES magazine's Top 100 Games of 2006. Chris' "Long Shot", was published by Z-Man in 2009 and "Cinque Terre" was published by Rio Grande Games in 2013. 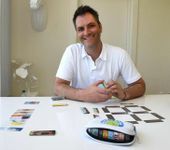 Chris Handy launched Pack O Game, a numbered series of ultra compact card games in 2014. Further information can be found at Perplext.